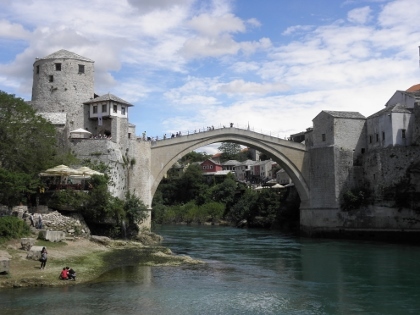 The Old Bridge Area of the Old City of Mostar is a place of memory to its multicultural background. The town developed mainly during the Ottoman period, from the 16th century on. The (Old) Bridge is its major landmark, and the town even was named after the bridge keepers (mostari). The Bridge was built in 1566 upon design of the great Ottoman architect Kodja Mimar Sinan and constructed by his pupil architect Hayruddin. Besides the Old Bridge complex, other Ottoman constructions include the Kriva Cuprija (“Crooked”) bridge, the Cejvan Cehaja Mosque, the Koski Mehmed Pasa mosque complex , the Vucjakovic Mosque, the Neziraga Mosque, a Hamam and Tabhana. Also there were many common buildings such as shops, inns and houses. 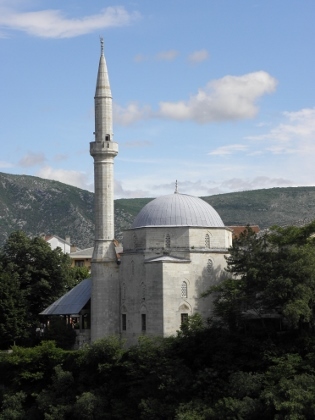 During the Austro-Hungarian period of the 19th century, a number of administrative and Christian religious buildings were added to Mostar’s cityscape. These were mainly located on the right bank of the river, across from the old Ottoman (muslim) town. Between 1992 and 1995 the town and bridge have been badly damaged during the Bosnian war. Its excellent reconstruction based on in-dept research has been compared to that of Warsaw. The completely rebuilt bridge opened on July 23, 2004. The Old City of Mostar is a lovely place to visit. Since the war has ended, it has become part of the beaten path of tourism. The early morning, before the tour buses arrive from the Croatian coast, is about the only time that one can enjoy it without being among masses. The nominated area is quite small, and you could see it all in half an hour. I roamed around for a few hours more, looking for the best photo opportunities. The Old Bridge is the main point of attraction of course, and it stays interesting when you look at it from different angles. From beneath, I watched the local “bridge jumpers” for a while. They’re mainly just showing off for the tourists (and collecting money from them), but in the end I saw one jump. The river doesn’t even look that deep, but the guy came out alive and smiling. 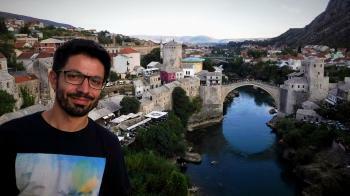 I stayed in Mostar for 3 nights, so I could visit also some other places in the region. I had arrived overland from Belgrade via Sarajevo during an 11 hour journey, that took me right across the country. Nothing much changes at first, because the part where the Bosnian Serbs live (Republika Srpska) borders Serbia. So still there were signs in Cyrillic and lots of little pekara (bakeries). The more inland the landscape gets more spectacular though, almost Alpine with some snowcovered peaks, mountain passes and wooden architecture. Lakes, rivers and canyons add to the great scenery. The country’s political structure is still a weird construction, and I noticed quite a bit of provocative flagwaving that reminded me of Lebanon. The blue & yellow Bosnian national flag is the one that is seen the least. The “international cooperation” part of the nomination may have had more to do with the international sponsors than the struggling parties of Bosnia Herzegovina itself. Japan has provided the city with buses, Turkey and Jordan took care of a mosque each, and Italy, Turkey, Netherlands and Croatia all donated to the restoration of the Old Bridge. The cute little Crooked Bridge was repaired with money from Luxembourg (probably felt that it had its size in common). Money obviously has poured in after the Bosnian War ended, and this resulted in a quick and succesful reconstruction of the Old City. One wonders if something like that will happen again for Aleppo or Damascus. Somehow I doubt that. The city of Mostar, in Bosnia and Herzegovina, known for its 16th century bridge (Stari Most), after which it is named, was sadly brought to the public’s attention during the 90s due to the horrors of the Croat-Bosniak war that followed the collapse of the former Yugoslavia. Amidst the destruction of most of the modern and historic city and the absurd number of victims, even the landmark of the city was destroyed. Stari Most, a 16th century Ottoman bridge, one of the most important pieces of Islamic architecture in the Balkans, the most recognizable landmark of Mostar and the connection between the two parts of the city across the river Neretva, was destroyed on November 9th 1993, after standing for 427 years. In October 1998, UNESCO established an international scientific committee to help the reconstruction of the bridge, assuring a design as similar as possible to the original and the use of authentic technology and materials. The new bridge was finally inaugurated in July 2004. Many of the historical buildings in the Old Town were also restored or totally rebuilt. Several countries helped funding the reconstruction of the bridge. 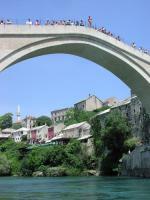 Nowadays, the Old Bridge Area of Mostar is a vibrant, tourist place and market. There are many restaurants, souvenir shops and it’s generally a nice place where to spend a few hours and learn about the history of the city. Thanks to the efforts of UNESCO and all those that helped, Mostar and its people got back their bridge that represents a remarkable symbol of peace, cooperation and solidarity. I visited Mostar and marvelled at the Bridge at Mostar in 1964. On a trip that included the Pont du Gard, the Palais des Papes in Avignon, the Leaning Tower of Pisa, the Duomo in Florence, and St. Mark's Square in Venice, the Bridge at Mostar was then, and is now, the most beautiful and memorable of all of these. In 1964 we drove a small red VW Beetle up along the eastern bank, and, since there were no crowds, no tourists, just stopped and stared, and took in the beautiful sight of this curving arch over a deep ravine and greeny-blue river. We walked, along with many others, across the bridge. There were a few donkeys and carts, lots of women with heavy baskets, and headscarves on their heads, using the bridge as it had been used for so long. I was so fortunate to see the original bridge, at at peaceful time. I shall never forget the experience. I visited this WHS in April 2014. I travelled by car via Medjugorje as the highway from Split was closed just after the lengthy border crossing. It took much longer to arrive this way but looking on the bright side, it gave me the opportunity to visit Medjugorje and drive past several vineyard fields without encountering any problem whatsoever. Euro currency is accepted almost anywhere but you can easily find foreign exchange outlets in Mostar. Apart from the symbolic importance of the Stari Most (old bridge), the Muslim side is very interesting with a small bazaar, an Ottaman house and a small mosque open to the public. Dress code is not as strict as in other mosques around the world and you don't need to take off your shoes for example. The highlight of my trip was climbing the Koskin-Mehmed Pasha's Minaret as I never climbed a minaret before. Moreover, it offers a great panoramic view over the old bridge (photo). On the whole Bosnia is the least developed of the Balkan countries I visited and the one which has least recovered from the war - there are still bullet holes on the building facades and bombed buildings all over the country. Nonetheless it is a very interesting country and well off the beaten track, especially in the Serbian Republic side of Bosnia & Herzegovina. Keep your eyes open when driving through the countryside as you'll surely meet cattle with long horns, sheep or goats crossing the roads! So be extra careful and enjoy! I was lucky enough to visit the original bridge when I travelled to Yugoslavia for the winter olympics in 1984. It was a magnificient structure and I am thankful that I got to see it and that I have photos of it. Hopefully one day soon I will be able to visit the reconstructed version. After having been heavily bombarded during the Yugoslavian War Mostar is now experiencing a revival. The old town is full of shops, bars (and - tourists) and is very picturesque. It is sometimes difficult to believe how free of conflicts the combination of Europe and Islam can actually be. Nonetheless, Catholic Croats in Bosnia still often descriminate against Muslim Bosniaks and as both populations share Mostar a deeper look into social interaction may expose these fresh wounds. Nonetheless, I found the locals incredibly friendly and the food very good. The Mosque was a bit disappointing whereas the traditional Ottoman Slokovic House was a nice surprise. My name is Aner, and i was born in Mostar a long time ago. I left this great city when i was only 6 because of a stupid war. I visited Mostar in June of 2007 for the first time since i left. It was the most fun that I had in a long time. The old city is full of beauty and excitement. I am glad to see that people all around the world are still visiting this city. If you want to see nature, history this is the place to go. I might have left this city a long time ago but this is allways going to be my home town. Mostar turned out to be a great surprise and a wonderful city. The famous old bridge was destroyed during the war in 1993, but rebuilt about 10 years later with the same techniques as the former old bridge. It brings back the connection between the Christian and the Muslim side of the city. Around the old bridge are lots of old houses that host shops, restaurants and bars. On weekends during the summer people from all around go to Mostar to party between the restored buildings, but also in the shot down ruins that are still all around the city. The war is over and even though you can still clearly see the remains of it, the residents have moved on and made Mostar a great city. I have recently returned from a holiday in Bosnia and Herzegovina which, of course, included a visit to Mostar. It is hard to shake from one's mind the images of the original Stari Most falling and a certain scepticism about how good the restored version would look - essential as it was, for many reasons, to replace it. But the restoration of the bridge and surrounding area is very impressive; it looks a little new but a few years of weathering should see to that. Those who crossed the original are pleased to learn its principal attribute is intact: it is very slippery when wet! Mostar is easy to reach on coach tours from the Croatian resorts and visitors are obviously returning in some mnumbers. However, it is also a good centre and visits to some of the unsung sights of the area - Kravica Waterfalls, Blagaj, Pocitelj, Radimlja necropolis - are easy with a car. The country's spectacular scenery can be readily appreciated by driving up the Neretva Valley to Sarajevo, now a well-restored, fascinating, vibrant and friendly city. Don't just visit Mostar - there's a beautiful country out there waiting to be discovered! Due to the war of 1992 between the neighboring countries I was forced to leave my life behind me as I was ripped away from the city of my birth and the people I love..I have seen many cities in the 11 years that I have been away but I have yet to see the city that has the beauty of Mostar...The green river that seems calm and cool on the surface has a great strenght and power underneath and to the eye of a stranger one would never know the fierce strenght of the river underneath.The Old Brige stands there proud and tall holding the two sides of the city in unison.During the summer the Old Bride is the main attractions as the local boys prepere their dives of the 27 meter long monument for numerous visitors visiting the city from all sides of the world. The night life has your ear intunned to the sound of Bosnian music echoing the streets laid out in pebbeld stone. The city so full of culture has you licking your fingers once you have had a taste of what it has to offer.Even after so many have tried to destroy it, the soul of Mostar leaves on with its head helad up high. bridge and the surounding. Just being on the bridge gives you the feeling of great historical value. New (Old) Bridge is the same as the Old Bridge. Everyone should visit the Old City, the food is great and people are very welcoming. The inscription in 2005 of the old city of Mostar and its bridge brought back memories of our trip there in June 1988. We had a pleasant visit and had followed the descent into civil war between 1992-5 and the destruction under cannon fire of much of the city and its famous bridge in Nov 1993 with sorrow. As outsiders we knew about, but could not of course fully understand, the depth of ethnic and religious tensions within Yugoslavia but the place had seemed peaceful and friendly enough when we were there. The city was reasonably interesting and atmospheric to wander around but the real “star” was of course the bridge. Reconstruction “started” with the lifting of a single stone as early as Sept 1997 but didn’t really get under way until 2001 and the bridge was officially reopened in July 2004. I suppose the rebuilding and the inscription as a WHS are necessary and worthwhile symbols to try to help build Bosnia as a peaceful country but I guess that a common community is going to be harder to build than the bridge! Els has kindly provided a picture of the bridge in 2004 from a similar angle to mine to enable you to see what sort of reconstruction job has been done on it! It would be interesting also for this site to receive a “first hand” description of what Mostar is like today as a community and whether it too can be/is being reconstructed. Is there anyone reading this from Mostar? Notable Bridges: Stari Most, a 16th century Ottoman bridge. The Old Bridge stood for 427 years, until it was destroyed on November 9, 1993 during the Croat-Bosniak War. It was rebuilt in 2004. Damaged in War since WWII: Yugoslav Civil Wars. Bridge damaged during 1992/3 and finally destroyed on Nov 9 1993. Ottoman Empire: Chief administrative city for the Ottoman Empire in the Herzegovina region. Built in the 16th century: The town was fortified between 1520 and 1566, and the bridge was rebuilt in stone. The second half of the 16th century and the early decades of the 17th century were the most important period in the development of Mostar.